• Safely transports and recharges up to 30 iPad or other Tablet devices including Samsung Galaxy Tab, HP Touchpad, Blackberry Playbook and many others. • 38"H x 22"D x 20"W cart - 5" locking casters. • Two internal shelves with wire separators?? • 6 ft power-cord UL Rated at 15 amps. • Net weight 92 pounds. 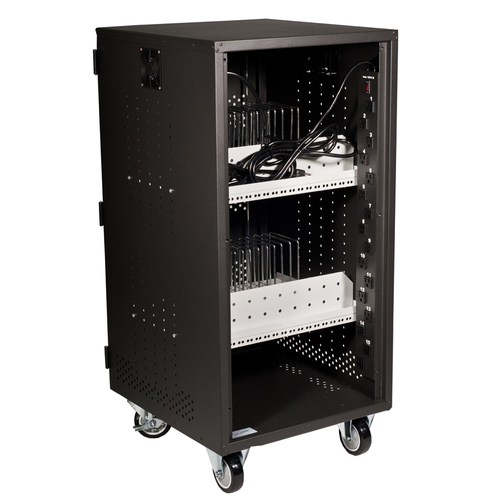 Specifications: •42.1"H x 20.1"D x 21.7"W cart •Interior Shelf 15 7/8" D x 19 7/8" W •Max width of the slots as 30 bay configuration: 0.79" •Max width of the slots as 15 bay configuration: 1.77" •5" locking casters •Two internal shelves with adjustable wire separators •Store and charge variety of devices at same time •Add an extra shelf and bins for smaller devices (cell phones hand held GPS etc.) •Wire management allows charge cables to be attached under each tablet •Safely hold/charge tablets with anti drop/shock covers •Heavy duty locking system, 4 spare keys included •Removable back panel with security bolts for easy integration and to stave off unwanted access •Two UL approved 15 outlet, lighted, breaker protected, switched power strips •20 CFM cooling fan •Two 6' power-cords, UL rated •Warranty: Cart 12 Years, Electrical 1 Year •Ships via truck only on a palette, net weight: 107 lb.